Ok, so I’m a bit late on this one, although I did see it on the Tuesday following its premiere. I’ve had time to mull over about what I feel on this one. So, just a quickie. I apologise in advance, there will be some spoilers. With Dredd in 3D, it’s actually something one should see in 3D, but there are a couple of issues I had with its 3D showing. The special effects department put an intentional film grain in the movie, as almost every movie made in hollywood these days is digital, so no film grain present. However, film grain can be added, see the Grindhouse flicks from Robert Rodriguez and Quentin Tarantino for reference. The downside in adding filmgrain in 3D, it kinda takes away from the special effects of the drug scenes, where the 3D is strongest. The majority of the movie, where its the gritty world, where Dredd and his partner are, is very much a 2D setting, but whenever someone doses up on the drug known as Slow-Mo, you get a euphoric response out of the visuals, everything becomes more enhanced and beautiful. The part that literally made my eyes and brain cry out in pain was the film grain effect put in during those scenes. 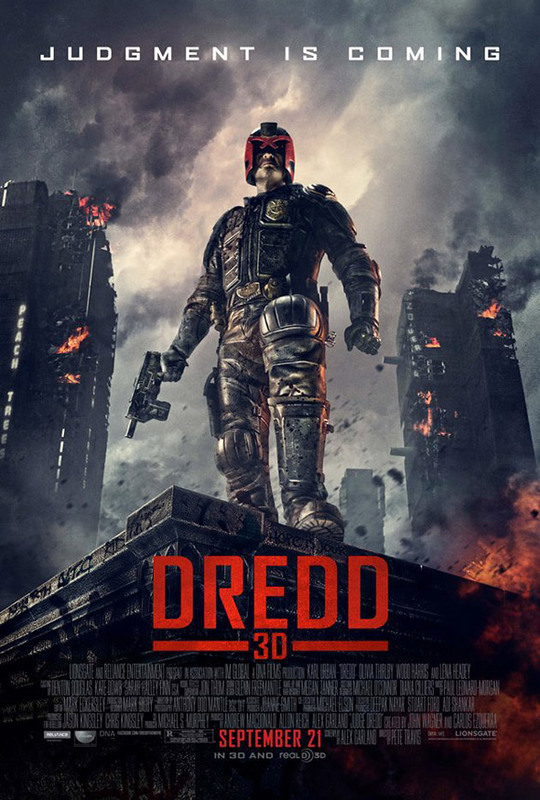 After all this, it’s still a great flick, and does Dredd as a comic book character justice. There is some controversy that due to its similarity to The Raid:Redemption, people think it’s a blatant rip off, but with Dredd in it. Granted, yes, the basic premise to the building, and the villainess is the same, but the execution is very different. The Raid is by all accounts, a martial arts film, with the added bonus of guns and is exceptionally good. In Dredd, its more so about being an action film, with lots of guns. The plots are where things begin to differ, mainly in Why they are in the buildings. In The Raid, it’s a senior cop lies to a swat team to get revenge on the mob boss. In Dredd, it’s actually completely different, where Dredd and his new partner, choose to go there, because 3 murders have been reported and they go to investigate, only when they realize that a drug queen is in the building, and is the cause of the deaths, do they try to move forward and proceed with an assault on a room where one of the men responsible for the 3 deaths, could lead back to the drug queen. The character development is different, with Dredd we see the tough as nails street judge take on a new partner, whom is borderline on failing, unlike in the Stallone flick, he gets partnered with a Rookie, whom had top scores in her class. This flick also incorporates much more science fiction and scientific methods to what has happened with the environment around them. In Stallone’s flick, they just happened to be there, and we don’t really know why things have decayed in the wastelands of the US. In Urban’s Dredd, we know right off the bat, during his monologue, why things are the way they are, and what has happened as a result of the land being subject to ambient radiation from both the Sun and previous nuclear war. Granted some of it has a few clichés, but they’re forgivable due to the great presentation and acting done by Karl Urban and the rest of the cast. The movie may not have done well at the box office on opening weekend, but its worth seeing, and if you miss it in theatres, give it a rent. It’s a great flick, don’t let the previous iteration sway you. Don’t get me wrong, I love the old one, because of its cheese, but this one is great on a movie goers level, you get high amounts of action, and a great story told exceptionally well and great visuals. Its win-win to me. Side Note: I’ve been caught up in watching some of the shows returning this fall, so I haven’t been able to catch up just yet on Revolution, but will be doing so this week. This entry was posted in Movies, Reviews and tagged Dredd 3D, Judge Dredd, Karl Urban, Lena Headey, Movies, Sylvester Stallone, The Raid. Bookmark the permalink.